Samsung Pay, the tech giant's mobile wallet, has seen â¬100 million ($124 million) in transactions since launching in Spain in June 2016. It was used for more than 2 million transactions in 2017 alone. The wallet grew from 5% of eligible users in 2016 to 19% in 2017, although it's possible that the actual number is higher, because Samsung didn't specify if the figure reflects customers with eligible devices or customers with both eligible devices and eligible cards. Mobile payments awareness is high, and itâs increasing. Seventy percent of Spanish consumers knew about mobile payments in 2016, and that number grew to 75% in 2017. The wallet has influenced purchases of Samsung smartphones. Seventy percent of respondents said that one of the reasons to buy a Samsung smartphone is to continue enjoying Samsung Pay. Thereâs high satisfaction among Samsung Pay users. The convenience and simplicity offered by Samsung Pay are key factors for 75% of respondents, who said that they're highly satisfied with the service. And 74% said they would recommend the wallet to family and friends. Samsung could replicate that growth in new markets. Samsung Pay has been particularly successful in targeting consumers who are accustomed to contactless payments, and are therefore more aware of mobile payments â" 30% of all card payments in Spain in December 2016 were contactless, compared with 12.5% in December 2015. And because of its distinctively wide acceptance network â" Samsung Pay has technology that allows it to be used anywhere that mag-stripe cards are accepted, as well as at newer NFC-enabled terminals â" Samsung Pay has enabled consumers to use it for most transactions. 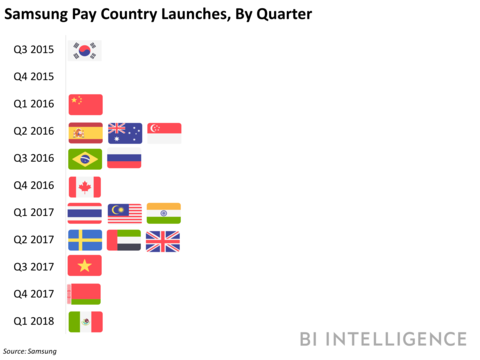 Samsung Pay is continuing to expand, launching this week in Mexico, its second Latin American market, and twentieth global market. The firm partnered with some of Mexico's leading banks and payment providers, including American Express, HSBC, Mastercard, Santander, and Visa, which could give the mobile wallet a wide potential base of eligible users through which it can replicate its success. Sizes the US in-store mobile payments market and examines growth drivers. Analyzes headwinds that have suppressed adoption. Identifies three strategic changes providers can make to improve their results. Evaluates pockets of success in the market. Provides actionable insights that providers can implement to improve results.